“Heavy Consumers” of the website will have to put their hands in their pocket to have full access to the website. The New York Times will enforce its digital subscription plans upon UK and US users on the 28th March. 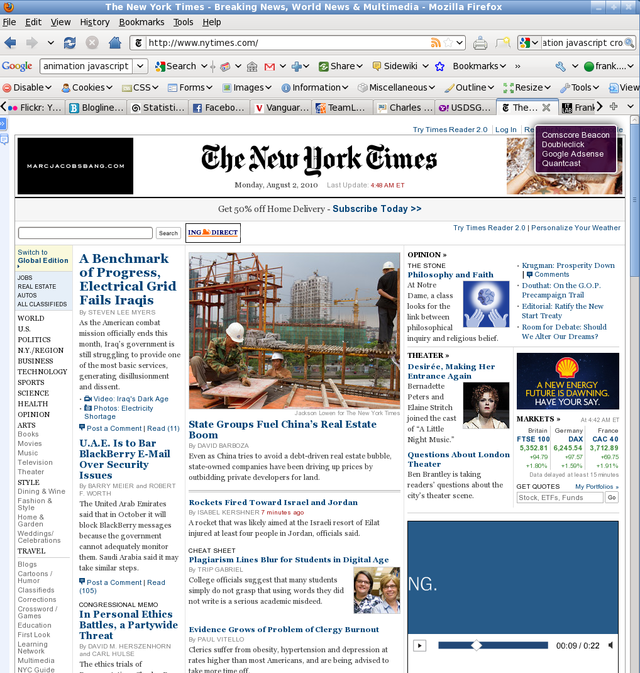 In a move similar to The Times (though undoubtedly more generous), which began charging to view website content in July 2010, visitors to nytimes.com will be able to view up to twenty articles before they are required to join one of three subscription plans. Users who want to have full access on their mobile device will have to pay $15 (or about a tenner) a month, and for those of you who wish to have full access via ipad, you’ll have to fork out $20 (just under £15) for website and ipad app access. If you’re a regular visitor to the site, but don’t want to put your hand in your pocket, don’t fear. Everyone can view the front page and the Top News section along with twenty articles a month. Even if you read twenty articles in one day, you can still read a further five articles if you search them via google. Furthermore, following links from blogs and social networking sites doesn’t eat into your twenty credits. In fact it seems like there’s so many ways around paying, you may as well treat yourself to a £10 present each month, and get on the website by other, far less expensive means. We will have to wait and see the impact this has on nytimes.com and it’s print readership, but for those who want a heads up of what may happen, here’s a link to an interesting article about The Times paywall. this article accurately highlights the paradox of paywalls – those who are most internet savvy (usually young people) who currently aren’t paying won’t actually be prevented from accessing articles by working around the paywall. I wonder if they allow this because they’re a bit fearful their readership will suddenly plummet? I’d like to thank the author of this post for his tips anyway! Joe Brothwell- as beautiful and inspiring as his journalism- sure to be an overnight internet sensation. I disagree, although granted this is far from Brothwell at his best, it’s still head and/or shoulders above the competition. Keep it coming!